Who doesn’t want a spotless presentation of the dining and kitchen table when they are expecting important guests? We’ve just the right item for you to make the countertops and tabletops sparkle and add lots of style and glamour to them. Any guesses? We are talking about Spoon Rests! 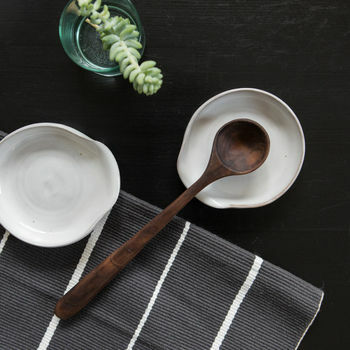 A modern, stylish and unique spoon rest could make your dining and kitchen tops stand out. So exactly why do we need a decorative spoon rests? Even when there is only one meal being cooked, there are a couple of spoons and ladles that are used. But what happens when they aren’t in use? When you are cooking and stirring, you never know where to put that dirty spoon without leaving the sauce all over in the kitchen. That’s where a spoon rest comes in. It not only contributes to the grand looks of the worktop and it also offers a place to keep the spoons and ladles while they are out of use. Elegance and form meet function in designer spoon rests. If you’re in the midst of stirring soups and sauces, without a spoon rest you’ll end up putting your dirty cooking utensil on the countertop. This could lead to possible contaminants getting into the food, and it ends up making a big mess on your worktop. Hygienic spoon rests solve both problems at once by offering a fixed area for cooking utensils in use. Spoon rests come in different size, shape, and material. The best idea before buying a spoon rest is its purpose. Are you a regular cook who prepares elaborate meals? You may need a large spoon rest for multiple utensils. It’s best to look for a material that matches your dining or kitchen décor and is also easy to clean. Ceramic is a classic material that is perfect for kitchens with a rustic or traditional design. Indiavaale have just the right design of ceramic spoon rests that are meant for a polished and fashionable décor. These designer spoon rests from Indiavaale are supremely crafted by rural artisans who’ve put traditional art into its making. These ceramic spoon rests from Indiavaale offer a curvy design with a shallow bowl so that there is plenty of space for residual liquids when you put the spoon down. Check out Indiavaale’s website and select your favorite handcrafted spoon rest. Then have it delivered carefully right at your doorstep in no time.